Farming Mageweave Cloth is easy but the price of Mageweave fluctuates from 10 silver to 1.5 gold per cloth, so be careful you don’t farm a lot of it without checking its price on the Auction House first. It might be easier to farm something else, sell it and buy Mageweave. At 10 silver Mageweave is almost better to sell to a vendor than it is to sell on the auction house. Mageweave drops off Humanoids between levels 45-51. You can farm Mageweave as soon as you’re high enough level to kill level 46-47 ogres. However if you’re max level you can steamroll dungeons and collect even more in a shorter period of time and without the trouble of PvP and exhausting the available humanoids. Obviously if you have AoE abilities it will speed up your rate of collection. Update: You can make a lot of gold with Mageweave, but if you want to step it up and make thousands of gold you should read my personal favorite guide. The best place to farm Mageweave Cloth is from either Strat or Zul’Farak. I personally prefer Zul’Farrak but it really seems to depend on personal preference. If you have time then try both! Remember you can do five instances every hour and you can reset the instance by exiting, right clicking your portrait and selecting to reset all instances. 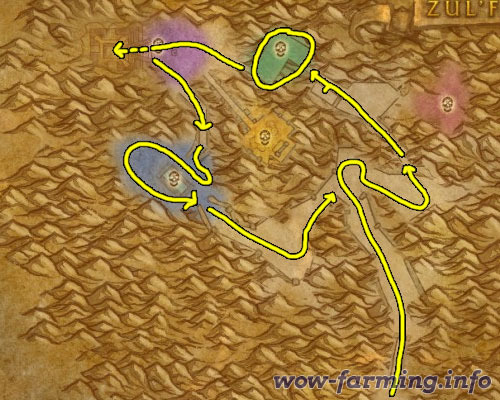 Zul’Farrak: In ZF, circle the dungeon clockwise, stopping in the northern room (green) to open all the tombs. Each has a good chance of releasing a zombie who will drop some Mageweave. Stay mounted as often as possible (you’ll get dismounted now and then) and fight only when you have big groups of mobs around you. This is obviously only suitable for a level 85. See below for a lower level farming locations. 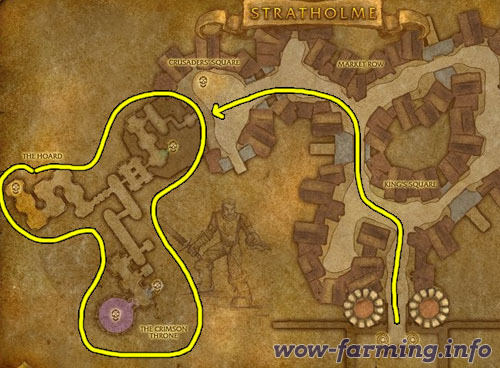 Stratholme: As for Strat, enter the living side and run to the Crusader Square right away, clear all the humanoids in the square and then in the castle itself. Clear everything. You will also find several Righteous Orbs which may be valuable on your realm. If you’re an enchanter you might be able to make to gold by selling crusder enchants on your auction house. These are made with Righteous Orbs. 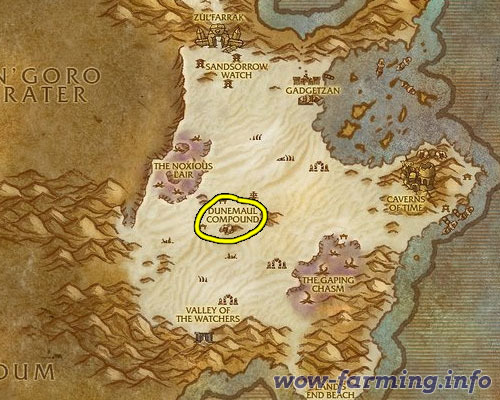 The next best place to farm Mageweave cloth is in Tanaris. The Dunemaul Compound in about the center of Tanaris is crawling with ogres who will drop Mageweave. If you’re high level you might risk killing all the ogres and waiting for them to respawn, but if you’re level 45-50 you will gain experience, valuable gear and Mageweave. The ogres are level 46-67 and are found all around the compound.